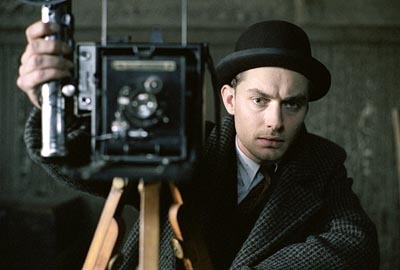 Sam Mendes' Road to Perdition has a lot on the surface -- well-trodden themes of father/son loyalty, that slick neo-noir cinematography, some clever camera work, a host of oily, volatile secondary characters -- maybe too much, according to some. 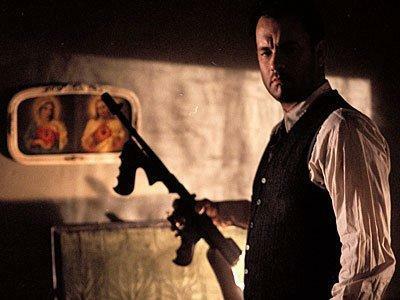 For a director who got famous making morally ambiguous, thematically twisted films like American Beauty and Revolutionary Road, Road to Perdition seems almost too straightforward, too direct about its hero's journey. Michael Sullivan is indeed a comic book character, and you could be forgiven for mistaking Road to Perdition for a boringly typical comic book movie. But this figure has a ground -- there is a thematic inner world to the film, expressed in both a literal and a metaphorical layer, that brings a formal unity to the whole thing. You won't appreciate everything this deceptively well-constructed film has to offer until you recognize its inner life, the way all the parts interlock seamlessly. Of course, we shouldn't pass by without mentioning the beautiful, polished images created by Conrad C. Hall, who won the Oscar that year. This world is dusty and exposed by day, inert in its overcast grays, but at night, it's all angles and shadows... more than shadows, it's a funhouse of black surfaces and bottomless abysses. It's an indifferent world, freezing cold or stuffy and still, with the blessing of a cool breeze only at the end, on the beach, as the plot folds back upon itself. That polished cinematography is the first clue to how the film functions on a symbolic level. Each scene is meticulous, the camera work is orderly and slow-moving, and every element is isolated in the frame, so that all the spatial relationships can be clearly identified. These people are parts of a well-oiled apparatus, oriented to one another by their loyalty, their malice, their dependence, their pivotal, inescapable utility. That's the subtext to the whole film: we are inside the machine. Here, before the camera, Mendes and Hall and Hanks lay bare the internals of a great mechanism, and Michael Sullivan Sr. is the rogue component, the cog that's slipping its axle and forcing everything to grind to a halt. When Harlen Macguire asks Michael what he does, he tells him he's "a salesman. Machine parts." This is the first time he gives a cover story, but it doesn't seem to come out of nowhere... he's spent the whole film assembling various firearms, hiding them away, and explaining their use. In fact, in practically every sequence, the camera fetishizes machines -- we start with a shot of Michael Junior riding his bicycle, and eventually, he graduates to a full motor-car, becoming his father's getaway driver. Harlen the hitman is not simply a murderous reporter -- he's a mechanical eye, a walking camera that captures the souls of the people he murders. It's a world of telephones and combination safes and locks and keys. Everything in the film seems to jingle and click together and "turn over," the totems of a clockwork world that seems to run more smoothly than our own messy digital universe. That's the literalization of the film's unifying principle. In reality, the whole Irish underworld of the early 30's is a machine, and all the characters are locked into functional relationships with one another. Michael Sullivan, Sr. is the most reliable part in the whole apparatus at the film's beginning, a trusted enforcer for the local boss. Connor Rooney is the companion piece to his father, and John Rooney is the transmission for the whole local system, functioning on its own terms to serve the larger Chicago machine. As it turns out, it's Michael Sullivan Sr. who catastrophically malfunctions, provoked as he is by Connor Rooney's subterfuge. Once Sullivan's button is pressed, he switches into revenge mode. He can't be dissuaded by bribery, coercion, or even his desire to protect his son. He will destroy this machine from the inside, even after it's taken care of him since he was young. Michael Sullivan knows that there are some sins that are unforgivable -- there are some breakdowns that can't be prevented. And maybe that sheds some light on the film's moralistic father-son relationship, too. Michael Sullivan Sr. doesn't seem to be able to extract himself from this system of reflexive violence... being a loyal enforcer, he's totally defined by it. But he struggles profoundly with his attitude toward his son, who he gradually initiates into the criminal lifestyle, while paradoxically trying to protect him from it. He gives his son a pistol to defend himself, he teaches him to drive a getaway car, he tells him to keep a lookout. At the same time, his misgivings are palpable... he distrusts his own father-figure (John Rooney) with the boys, he tries to deliver his son to his wife's sister, and he distances his son from the violence he carries out, albiet erratically. This is the behavior of a firmly entrenched part of a machine, trying to ensure that his son doesn't find a place in that same machine. And unto the end, in Michael Sullivan Jr's vulnerability -- in his inability to master the stick shift, his intense love for reading and religion, his dislike for math -- he's the most organic element in this plot, the bit of soft tissue that needs to be protected from the grinding gears of the criminal underground, lest he be torn apart. This comes across as clear as day when he sits with his father inside an old farmhouse, providing compassion and patience and sips of water. The boy is not a machine... he's the one real boy in this world of pinnochios, the sole human touch. The father-son relationships, the intrigue and depravity of the crime world, the Midwestern road trip through heartland prohibition... these are just the flesh of the story. Dig deeper, and you find its iron-clad, mechanical heart, all angles and edges and parts that lock into place... and then, even deeper inside the film, there's Michael Sullivan Jr., the soft soul peeking out from inside the great machine.